Enzymes are complex biological molecules which catalyze or greatly speeds up the rate at which a chemical reaction will occur. They are primarily proteins, but some enzymes, called ribozymes, are made of RNA. The key concept behind the speeding up of a chemical reaction by an enzyme is that it reduces the activation energy required for a reaction. In doing so, it speeds up the reaction. The work of an enzyme begins with the formation of an enzyme-substrate complex. In this formation, the substrate in some way binds to the active site of the enzyme, thus forming an enzyme-substrate complex. The interaction between the enzyme and the substrate facilitates the reaction and open a new reaction pathway for the reaction to occur. The active site is typically a very small part of the whole enzyme molecule. It is a three-dimensional entity formed by amino acid residues and which may come from widely separated regions of the protein. The active site is often a cleft or crevice on the surface of the enzyme that forms a predominantly non-polar environment and enhances the binding of the substrate. In an Induced fit model, the substrate induces a small change in the shape of the enzyme so that they can bind tightly. Originally two models were proposed to explain how an enzyme binds its substrate. If the substrate immediately fits the active site on the surface of the enzyme, we say that the formation of the enzyme-substrate complex works using the lock and key model. But, if the substrate induces a small change in the conformation of the enzyme so that they can bind tightly, we call it the induced fit model. As we all know, all reactions involve energy, but also, a certain amount of energy is necessary to initiate any chemical reaction. This is called Activation Energy. Thus, activation energy may be considered as an energy barrier over which molecules must be raised for a chemical reaction to occur. 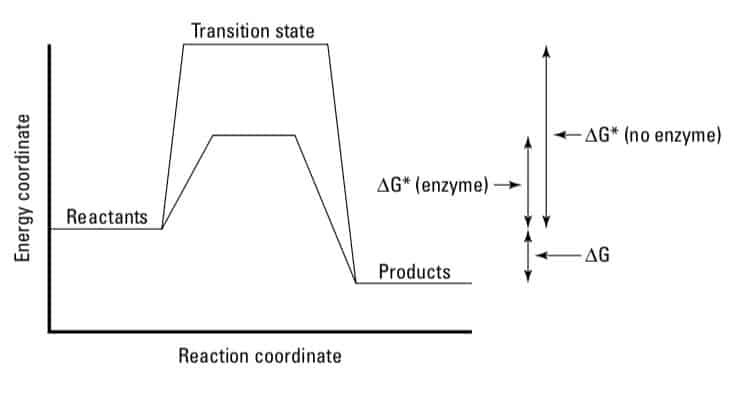 In a chemical reaction, the reactants begin with a certain level of energy, an additional amount of energy is absorbed to reach the transition state (∆G*, where the asterisk indicates the transition state), and then energy is released to reach the products. The difference in the energy between the reactants and products is ∆G. The rate of the reaction depends on the value of an additional amount of energy required for a chemical reaction to occur or simply the Activation Energy (∆G*). The greater the value of ∆G*, the slower the reaction is. An enzyme, like any catalyst, lowers the value of ∆G* and consequently increases the rate of the reaction. The enzyme does not alter the energy levels of the substrates or the products. 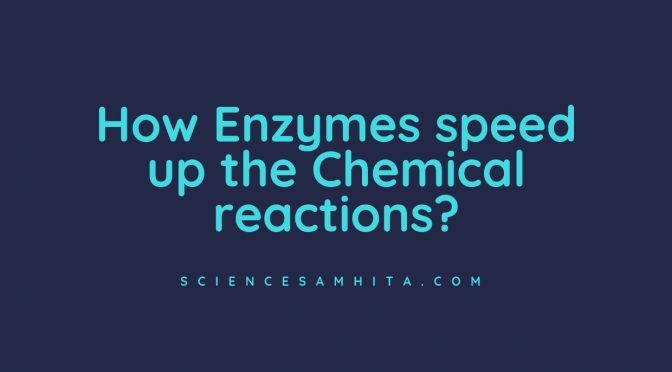 Thus, an enzyme only increases the rate at which the reaction occurs, but has no effect on the overall change in energy of the reaction. Also Read: 11 Industrial Products that are derived from Microbes. The factor with which enzymes speed up the chemical reactions can be very large (up to 1016 in some cases). It is far greater than any synthetic catalysts can achieve, and enzymes accomplish these astounding feats in dilute aqueous solutions under mild conditions of temperature and pH. In the absence of enzyme, this reaction is very slow, with about 200 molecules of H2CO3 being formed in an hour. However, by using the enzyme present within the cytoplasm called carbonic anhydrase, the reaction speeds dramatically with about 600,000 molecules being formed every second. The enzyme has accelerated the reaction rate by about 10 million times. The power of enzymes is incredible indeed! Hames, David. Instant Notes In Biochemistry. 3rd ed., Taylor & Francis Ltd., 2005. Moore, John T, and Richard H Langley. Biochemistry For Dummies. John Wiley & Sons, 2013. Walker, Sharon, and David McMahon. Biochemistry Demystified. Mcgraw-Hill, 2008. Previous Post11 Amazing facts about Butterflies.Next PostHow does a Tadpole change into a Frog?